Using my "cold day" to stay warm, get caught up with grading, and blog! This morning I thought I'd use some spare time to link up with The Teaching Trio for their Three Favorite Things linky! 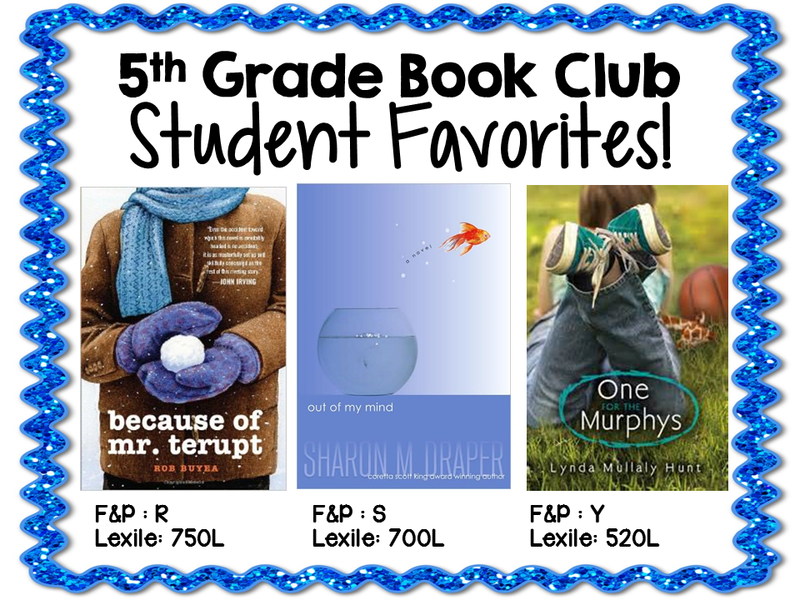 Since we just started a new book club, I thought I'd share my three favorite read alouds for 5th grade! This a monthly linky so check it out and don't forget to check back in February for my fabulous trios! Every year my partner and I evaluate our read alouds and book club choices! We have lots of great readers but we also have a lot of really reluctant readers each year. Many students just plain HATE reading... until we start some of the best read alouds! 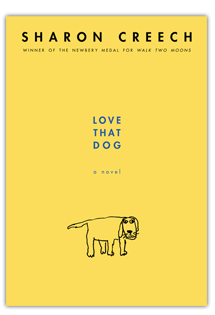 We start the year with Love that Dog by Sharon Creech. Not only do we cover a lot of figurative language and introduce students to poetry right away, it's also a small and very approachable book. The story weaves famous poets and poems into a great story about a boy named Jack who absolutely HATES poetry until he reads a poem by Mr. Walter Dean Myers! I always convert many "haters" of poetry after reading this novel! This book is also a great start to building that community of readers and writers in any classroom. 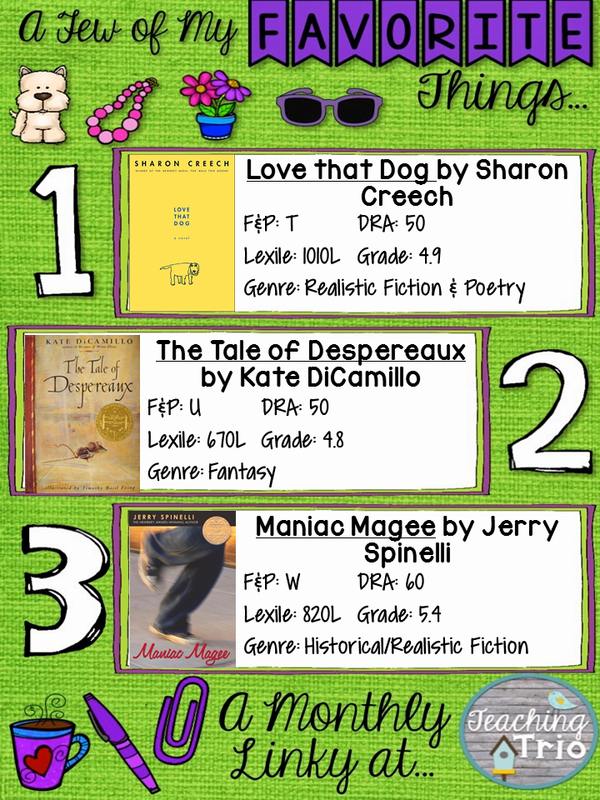 My next favorite is The Tale of Despereaux by Kate DiCamillo. No one can weave a story like Kate DiCamillo. I love so many of her books but this is my ultimate favorite. I love this book because even though it is fantasy it's so approachable. Many of my students don't enjoy fantasy, including my teaching partner, but the lovable Despereaux makes this genre easy to love for so many readers. It has suspense, love, bravery and a Princess Pea! This book is also great because it is told in three parts with an often non-chronological order. This is great to get students sequencing, thinking, and talking about events in the book. However, my favorite aspect about this book is that is has the BEST, BEST, BEST audio version! The narrator's voice is memorizing and those reluctant readers can instantly visualize this complex story. Click here for a preview. My students beg for "the man on the CD." 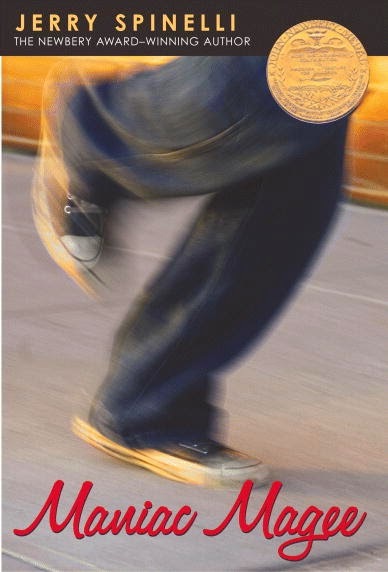 Lastly, my favorite read aloud for the entire year is.... Maniac Magee by Jerry Spinelli. Call me sentimental but this was one of my favorite books growing up as well. I remember bring the book on vacation to Florida and reading it twice during our trip. I simply could not let the story end! Jerry Spinelli has so many great books including Stargirl and Crash but no one can compare to the legend of Jeffery Magee. This text does so many great things. It brings in elements of historical fiction and folktales while using so many great author's craft techniques. Jerry Spinelli is so artful in his writing it is truly a work of art. However, the story itself brings about topics of conversation about bullying, racism, and homelessness. These are big issues that are real. I simply love the conversations that this book generates. If you're looking for some other great books for reluctant readers here's a few of my fifth graders' favorites from Book Club! What's your favorite read aloud? 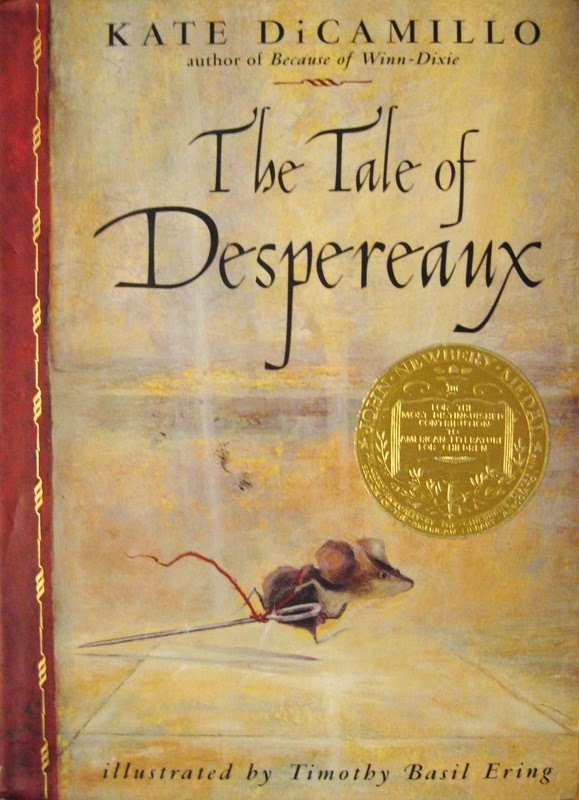 I LOVE the Tale of Desperaux and all of Kate DiCamillo's books. They make the greatest read alouds. We used Love that Dog to teach discuss poetry last year. Can't wait to use it this year!! Let me just say this... I love Kate Dicamillo. I met her at the University of Minnesota and she is amazing. I have read all of her books multiple times and my students know my obsession with all things Dicamillo. I recommend Tiger Rising! If you haven't read it, it is a real tear jerker. I had 8.... yep EIGHT students crying at the end of the book (3 of which were boys). They were so connected with the story and the characters! Thanks for sharing!! Book Clubs: Accountability & Freebies! What are you teaching in January? How about a Rockin' Giveaway?